The protector Sangharama, also known by the name Guan Yu or Guan Gong, is a Chinese deity but also one of the protectors of the Karmapa’s Tsurphu Monastery in Tibet. 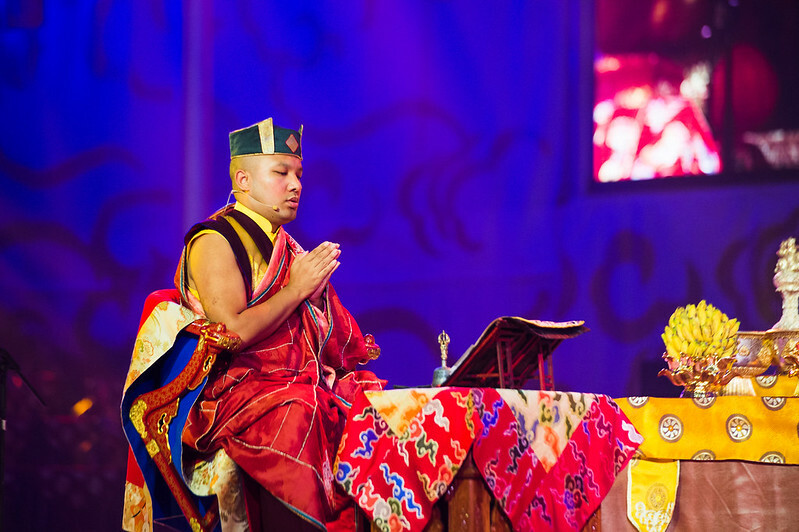 The connection between Sangharama and the Karmapa lineage began when the 5th Karmapa, Deshin Shekpa, travelled to China at the invitation of the Yongle Emperor of the Ming Dynasty. Sangharama, a local Chinese deity who lived on a mountain, was so impressed by the Karmapa, he decided to follow Deshin Shekpa back to Tsurphu Monastery, where the Karmapa offered him a new home on one of the mountains behind the monastery. It then became the tradition at Tsurphu to offer a practice to Sangharama each Losar. When the 16th Karmapa fled Tibet, the ritual was lost. The 17th Karmapa wrote a new liturgy, the one performed today, which uses both Tibetan and Chinese. Visit The Sangharama Ritual Picture Story for details.